This hugely popular site - their Bacon-Weave S'mores video racked up 11 million views and a quarter of a million shares within 24 hours - is the destination for fun, super-shareable recipes and stories that get people excited to get into the kitchen. The Delish editors want their audience to know it's okay to make a mess - food is meant to be shared, not perfected - and all of their content is 'accidentally educational," featuring step-by-step photography that's packaged in such a way that you don't even realise you're learning something. 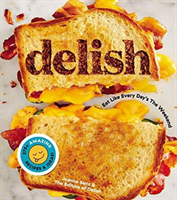 The fun-packed Delish cookbook brings the same message to the page, and features 175 recipes that are meant to be devoured: Grilled Cheese Dippers, Sloppy Joe Potato Skins, Chicken Parm Burgers, Lasagna Stuffed Peppers, Mint Chip Brownie Cups, Cookie Dough Cheesecake, and dozens more. This is the book their 30 million fans are waiting for.